Moving to La Marina, Costa Blanca, Spain. Jan, I came across your excellent forum the other day and we have listed your studio guesthouse. Apart from that I don’t know too much about you! Perhaps you could tell us a bit about why you moved to Spain? “My husband and I moved to Spain from the UK with our then eight year old daughter. My husband Don had to take early retirement because of health problems and so we wanted to live in a more relaxed environment with a slower pace of life. We also wanted our daughter to experience other cultures and learn another language, and finally we needed somewhere where we could get more value out of the pensions that we live on. How long have you lived in Spain and why La Marina? “We have been living here for over ten years now and are very happy to continue. We stumbled upon La Marina urbanisation by mistake when we were house hunting, having booked to see some Country properties with an Estate Agent that was located on the urb. We never did see those properties, but chose instead a villa in La Marina. We felt at the time that it was important for our young daughter to have other English speaking children to play with. It was difficult enough for her to be taken away from the friends and school she knew to be put into a Spanish school where no English was spoken by the teachers. La Marina urb was quite different then as there were only a few English speaking children in the school, and few English type products in the supermarkets. Within the next 5 years everything changed as the housing boom hit. Thousands of Brits were moving to Spain, especially the Costas – and it appeared that most were moving onto our urb! Within a year the ratio of children in the school had changed from a handful to 60% foreigners! Houses and shopping areas were also being built at an amazing rate, and British products, businesses and services soon followed. It was the boom years and we very exciting to be part of it. That was why I set up my website – www.lamarinaforum.com to give help and advise to “newbies” who were moving here from experienced ex-pats who had trodden the trail. Now of course, all that has reversed as young families have been forced to return to their own Countries when the jobs dried up. Is this the best part of Spain to move to, only I know we have many people reading who haven’t made the big move yet? “Whether it is the best part of Spain to move to is subjective. As I see it you have two main choices. You go native and move to a City, Town or Village where you will need to integrate totally into the Spanish life and culture and need to learn Spanish fluently as quickly as possible. Or you move to one of the many multi-cultural urbanisations that are scattered along the South Coast of Spain. Here you will live amongst not only Spanish, but an assortment of people of all nationalities. On the urb La Marina, you will find a majority of English speakers, which will make the transition a little easier, with plenty of friends to make, familiar activities to do and familiar food products. 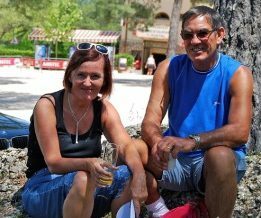 Is it all doom and gloom – do you find many people moving to Spain or has that dried up and have you considered leaving? Property prices are at their lowest, so grab yourself a bargain. However, if you have children over the age of say 10, or need to work, then now is not the time to move to Spain.